The University of Oxford's Centre on Migration, Policy and Society (COMPAS) last week published a comprehensive look at policies to control irregular immigrantion to the UK. You can read the 58-page report here. The report is the result of a four-year research project by a COMPAS team led by Dr Franck Duvell examining irregular migration and immigration enforcement in the UK. The study looks specifically at the UK's immigration law enforcement and its effects, impacts and limits. Irregular immigrants are defined in the study as individuals who do not have the right to stay in the UK, or have, due to their actions, had that right revoked, and are, if detected, liable to removal. The report considers the impact of increasingly tight legislation and robust enforcement measures, such as the Government's "hostile environment" policies, on irregular migration and on irregular immigrants. • How this suite of processes, actions and impacts are perceived and shape policies. Overall, COMPAS finds that there is little evidence suggesting that immigration enforcement brings down numbers of irregular immigrants. 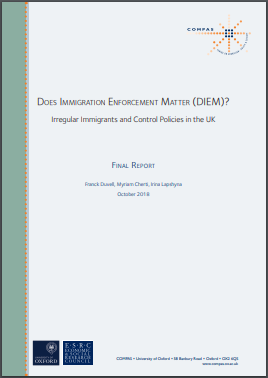 "Instead, immigration enforcement seems to have (unintended) side-effects; it increases human suffering whilst offering opportunities to criminals and giving rise to criminal practices and pushes irregular immigrants further underground," the report states. According to the report, the total numbers of irregular immigrants in the UK is unknowable based on current data and approaches to measurement, but it is believed to be in the hundreds of thousands, at least. The Home Office's Immigration Enforcement department is mandated to deal with those who do not comply with immigration law, though COMPAS says this is "comparatively small" with 5,048 staff as of 2016/17. COMPAS notes, however, that the Government's hostile environment policies have blurred the lines between stakeholders and enforcement agencies by putting the legal onus on landlords, letting agencies, financial institutions, the NHS and others to verify customers’ and patients’ right to be in the country. The report says: "The findings from this study suggest that as a side-effect of the current ‘hostile environment’ approach, irregular immigrants and their employers and landlords have developed diverse practices to prevent detection and have to some extent become resilient to the threat of enforcement actions. Thus, the numbers of those who are living without a regular immigration status may have increased. Furthermore, current policies appear to have contributed to an increase of certain criminal activities. For instance, several people interviewed for this study reported slavery-like exploitation, abusive landlords, and the existence of a market for false identity papers and other documents." The report concludes: "Emerging findings from this study suggest that immigration enforcement operations have limited effects. In all encounters by Immigration Enforcement only 29 per cent result in arrests; in all enforcement arrests only 19.4 per cent result in return, and in all returns it can be assumed that only around 15 per cent involve "conventional" irregular immigrants. This is broadly reflected in our research data, which found that of the 175 irregular immigrants interviewed, a total of 40 had experienced enforcement operations, only 11 were arrested and only one person was removed (but returned irregularly later)." Chai Patel of the Joint Council for the Welfare of Immigrants (JCWI) spoke to The Independent about the report's findings and said: "The hostile environment doesn't work to reduce irregular migration, but causes huge amounts of human suffering. From the beginning, the government has refused to evaluate the real impact of hostile environment policies, but after the victimisation of the Windrush generation that is no longer sustainable. All these policies must be immediately suspended pending a fully independent review." A Home Office spokeswoman told The Independent that the Government was committed to an immigration policy which welcomes and celebrates people here legally, but which tackles illegal immigration and removes incentives to enter and remain in the UK unlawfully. The spokesperson added that almost 45,000 foreign offenders had been removed from the UK since 2010.